I'd like to use weighted random mode (last played and play count) with complete works rather than single tracks. By complete works i mean for example, a set of pieces consisting of various movements which could span an entire disc, or less, or more than one disc. If this isn't possible, perhaps just a 'Random Grouping' order (akin to 'Random Album') could suit my need. it's not currently possible, but I will add this at some point. I'm not sure what state it is in, but you could give it a try. Thanks to Quentin's help, I uploaded a new and improved version of Albumrandom in git. How it differs from albumrandom3 which also has a dir in your repo? Hi! 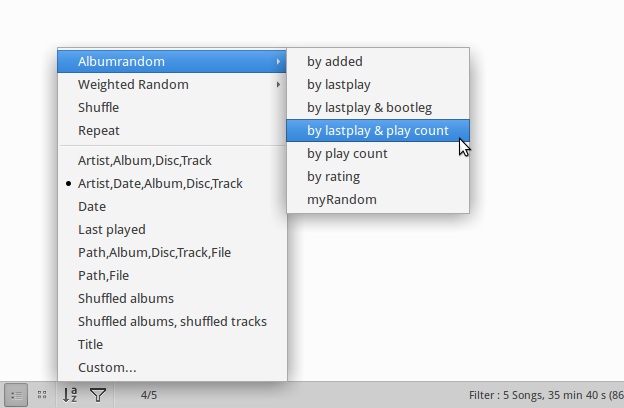 Albumrandom3 is "a new version", which is much more simplified (removed most of the silly options) and better integrated to gmusicbrowser (no more separate button, see picture). It's been unfortunately a really long time since I done these plugins so my memory on the details is a bit fuzzy. I'd still recommend you to try it out, it's what I personally use nowdays.